This middle school narrative tells about a close encounter in a Michigan wood. Last summer, when I went to visit my aunt in Michigan, she took me to her cabin in the wilderness. I taught it was going to be boring but actually it was fun. When we got to the cabin she told me where everything is. I took my compass, so I wouldn’t get lost, and went exploring. I saw many interesting things. Lots of birds and plants that I have never seen before. Still, I didn’t see any animals. So I went back to the cabin, and told my aunt Barbara about my trip through the woods. My aunt advised me that tomorrow, when I’m going to explore the woods again, I should stay still for a longer time and the animals would come out. The next day, when I woke up, I took my camera and went to the woods. I waited a long time and there still were no animals around me. When I was about to go back to the cabin, I saw a porcupine. He was very close to me! I wanted to take a picture of him. I got up and took some pictures. As I walked toward him, to get a even closer look, I slipped on a rock and fell on the porcupine. I had his quills in my hands. I was in a lot of pain. I picked up my camera with my mouth and went to the cabin. As I walked to the cabin my aunt saw me and ran up with help. She took me to the closest town to see a doctor. Dr. Johnson took out 23 quills out of my hands. He said I was lucky that we got to him so fast. The doctor also said that for a month or a little longer, I wouldn’t be able to do anything with my hands. On the first day of school we talked about our vacation. My story was definitely the funniest! I had the pictures and the quills to prove that it was the truth. My Summer in Michigan by Thoughtful Learning is licensed under a Creative Commons Attribution-NonCommercial-ShareAlike 4.0 International License. 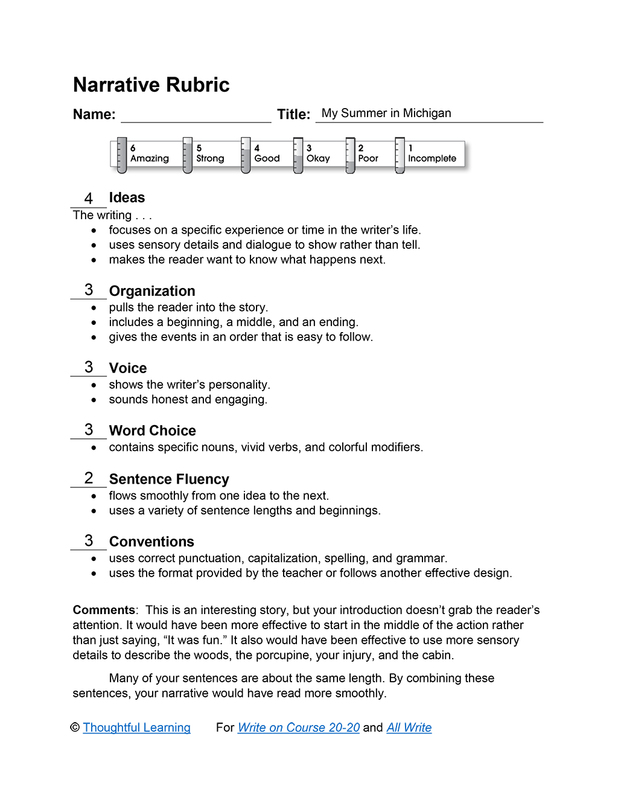 Based on a work at k12.thoughtfullearning.com/assessmentmodels/my-summer-michigan.